Dear Sara Luce, as you well know, my son Manuele, who is in the Sky, sent me numerous signs of his presence, already present on the book and on the website www.amorecheillumina.com and what I am attaching is the last gift that he has given me, however, this time, it was following a very specific request from me. To explain better, I have to specify that after a long journey in the name of knowledge, the point of union with the other side and with my own son, he no longer expresses himself any more, through the automatic writing, however he has internalized himself by turning into an internal soliloquy, which means that we communicate through the thought. 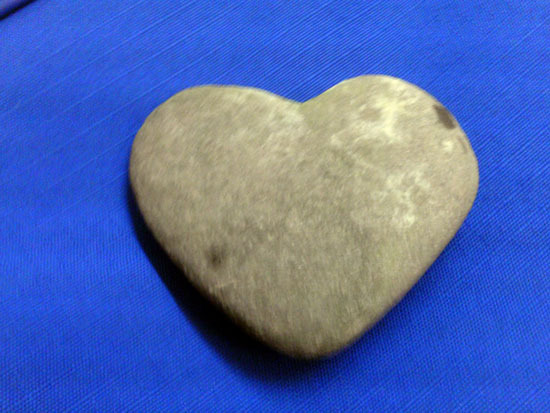 So, last August I was on vacation in Alto Adige Italy and, during a hike, I expressed to my son the desire to let me find a heart in the shape of a stone. The following day, after a long journey, I saw appearing out of the blue by my feet this wonderful stone, partly covered by a layer of soil. It’s a perfect heart as a demonstration of his love and of his constant presence.